Boston Marathon bomber Tsarnaev lawyers request delay after Paris attacks. 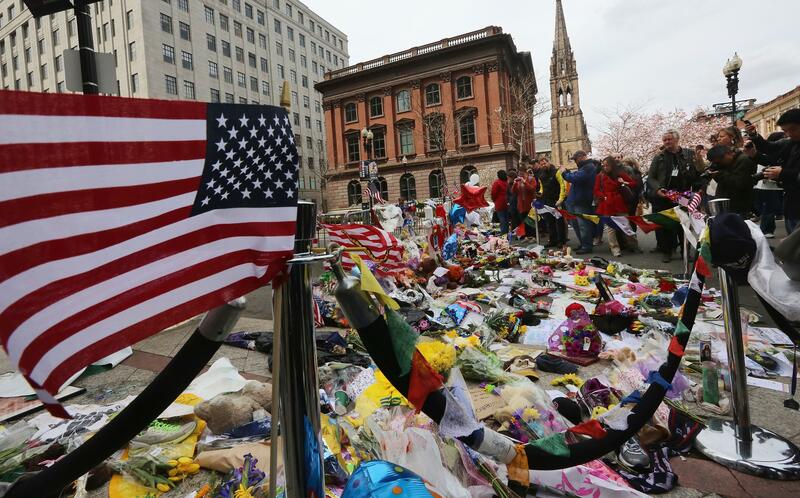 A makeshift memorial for victims near the site of the Boston Marathon bombings on April 20, 2013. Last week’s terrorist attacks in Paris could impact the trial of Boston Marathon bomber Dzhokhar Tsarnaev. Tsarnaev’s lawyers, worried news drawing parallels between the two attacks will prejudice potential jurors in the U.S., asked the judge on Tuesday to suspend jury selection for at least a month until the fallout from the Paris attacks dies down. Jury selection started last week in the case where, authorities allege, Tsarnaev and his older brother executed the 2013 attack that killed three people and injured 260 more in retaliation for American military intervention in Muslim countries. Almost immediately after the [Paris] attacks, the press, politicians, and commentators drew parallels between the French attacks and the Boston Marathon bombing…These parallels so widely expressed cannot be lost on potential jurors. Even though the panels have been instructed not to read media reports about this case, the probability of exposure to reports of the Paris events, which began before all of the jurors were instructed is exceedingly high… [The delay] would allow some time for the extraordinary prejudice flowing from these events—and the comparison of those events to those at issue in this case—to diminish. The jury selection process is set to move forward on Thursday with the jury pool that includes more than 1,350 prospective jurors who have already filled out questionnaires to help uncover any potential biases and will be further questioned by the judge later in the week.